In a world where humans a minority and androids have created their own civilization, a wandering storyteller meets the beautiful android Ibis. She tells him seven stories of human/android interaction in order to reveal the secret behind humanity's fall. The story takes place centuries in the future, where the diminished populations of humans live uncultured lives in their own colonies. They resent the androids, who have built themselves a stable and cultural society. In this brutal time, our main character travels from colony to colony as a “storyteller,” one that speaks of the stories of the past. One day, he is abducted by Ibis, an android in the form of a young girl, and told of the stories created by humans in the ancient past. The stories that Ibis speaks of are the 7 novels about the events surrounding the announcements of the development of artificial intelligence (AI) in the 20th to 21st centuries. At a glance, these stories do not appear to have any sort of connection, but what is the true meaning behind them? What are Ibis' real intentions? 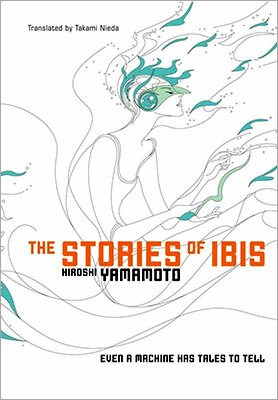 [widgets_on_pages id=”Science-Fiction & Fantasy World Tour”]The Stories of Ibis is a stunning collection of sci-fi short stories by Japanese author Hiroshi Yamamoto. In a near future, the remnant of humankind fights a well-flourished machine civilization for survival. The book starts as a storyteller faces an android, hurts himself in the struggle and surrenders. After transporting him to her own city, the woman-looking robot introduces herself as Ibis and offers a deal: while his ankle heals, she will tell him fiction stories. Since the convalescent is concerned with machine propaganda, she promises that no tale will relate “the true history about man and machine”. Thus, an overarching plot links the seven unrelated short stories together and makes the transitions smoother to the reader. The most wonderful thing about The Stories of Ibis is the natural way in which Hiroshi Yamamoto approaches modern technologies. I grew up along the rise of electronic toys, personal computers and consoles, internet, role-playing games and virtual friendships, all of which successively triggered its share of paranoia in the public. I enjoyed that the book was based on genuine experience and knowledge of the gaming culture. Also very natural is the way Hiroshi Yamamoto makes the best of typography to represents the different sources and depths of the narration. For instance, the protagonist of AI’s Story is an intelligent virtual character. When she narrates her role-played battle for humans to read, the text switches to bold. While her dialogs with humans follows usual punctuation, conversations with her virtual fellows are displayed between angle brackets. Also, machines enrich their vocabulary to meet their need: “Toucanan” designates humans hostile to AI, “gedoshield” defines the prejudices blinding humans, “kroof” is the “surprise at the gap between the basic information and the actual experience”. Sometimes, machines conversations are simply undecipherable and it only makes them more realistic. But more importantly, The Stories of Ibis is a clever reflection about the place of technology – especially robotics and artificial intelligence – amongst humankind. Hiroshi Yamamoto describes the undeniable benefit of robots that never grow tired, moody, or clumsy in The Day Shion Came, in which an experimental android is taught to work in a nursing retirement home. He also shows how technology allows us to transcend our biological limitation in The Universe On My Hands, in which an online game guild tracks one of its member to help him face real life issues, as well as in A Romance in Virtual Space – one of my favourite – where virtual worlds give a young woman the means to overcome her own barriers. Finally, Hiroshi Yamamoto emphasizes the interdependency of humankind and machine, especially in the beautiful story The Mirror Girl in which a little girl’s crave for a companion leads to the emergence of a new form of AI. Machines and humans, he shows, both thrive and suffer from each other. Finally, The Stories of Ibis progressively answers the question to how did the war start between machines and humans, and why the former won. It’s fascinating, because it leads Hiroshi Yamamoto to talk about our very human weaknesses. For instance, The Mirror Girl and AI’s Story illustrates human’s difficulty to acknowledge other sentient life forms, especially when they are deprived of a tangible body, as a computer AI might be. Also and more importantly, humans are scared of themselves: seeing themselves as belligerent and pugnacious, they imagine any intelligent races would behave in a similar way and consequently become a threat to humankind. Hiroshi Yamamoto shows how we do create tensions out of thin air by simply expecting others to be as mediocre as we can be. Nonetheless, The Stories of Ibis is a fabulous, refreshing read. It’s bright and cheerful, often funny, while driving the reader to reflect upon the technologies who came into our lives these past twenty years and those to come. I especially appreciated how Hiroshi Yamamoto writes about virtual worlds and online games, which are too often the subject of irrational terrors and accusations. The Stories of Ibis offers a bright and optimistic view of technology, which is rare enough to be celebrated! I highly recommend The Stories of Ibis to all lovers of Science-Fiction and/or Japanese culture. Finally, I would like to thank Carola who blogs on Brilliant Years and who introduced me to this book. Thank you! I hope you’re going to like it too! And thank you again for “The Woman in the Dunes” by Abe Kobo! I actually started it today!